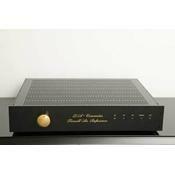 Air Reference DAC is one of Dr Forsells contribution to the world of Audio. It features a "1bit DAC" able to play Class A audio. It features 32/44,1/48khz conversion. Bought mine 2016 second hand (2000 $). It's the mk II version ~ 99% equal to Bremen Dac (8000 $). Military build quality: Heavy, runs HOT. Sound is stuning, liquid, effortless, airy, deeep, very analog. Owned other expensive units: Krell's, MLs, Pioneer Elite's, Apogee, Benchmark aso...Forsell is off the chain. Agree with comments below: if you can find one, dont even think about stallin'. Why stop the production ??? No other unit that I have come across can even come close to the sonic abilities of this mighty performer. Forget about Hyper-Stream ESS9xxx DACs of recent, they sound like loosers in comparison. Forsell has a sound you never thought possible. So sensual, so silky smooth and very "un"digital, very reminiscent of 300B triodes. No wonder they're so sought after and expensive on the used market. if you find one, don't miss the chance to own a product that really has no equal. This DAC redefined my highest standards of Hi-fi listening - period. Never before could I imagine it would be possible to extract soo much musical information from the CD format. No audio d/a EVER has been designed so maticulously and so taken to the extreme as this one. Everything, and I mean EVERYTHING, is taken to such an extreme level of sofistication, it is awe-inspiring. And once you start playing music, it is apparent.... that which you have been missing all along. I cannot believe this is a 30 year old unit. No other DAC in my humble opinion has been able to even come close to sonic performance of this gem. landscape of sound in front of you, the other competitors try so hard and yet accomplish nothing in comparison but tiny, rough, colorless sketches of the same sonic event. If you find it on the used marked, GRAB IT AS QUICKLY AS POSSIBLE!!!! I know a lot of audiophiles wonder about how this unit (soon to be 30 years old) measures up against newer designs. I have had the chance to own one, and compare it to many other, newer designs, and to my all-time reference, and here are the results. Developed in the late 80's and finished as a commercial product in the early 90's, the designer has held nothing back in order to create nearly ideal electrical conditions for the sound chip. In the newer, later, dac designs, the designers employ advanced solutions to reduce the so-called data-related jitter, which is very prominent and detrimental in external DACs (due to - among other things - the SPDIF transfer protocol used). Unfortunately, there is no such thing in Forsell Air Reference DAC. For this very reason, it MUST BE paired with a REFERENCE grade transport for good sound quality. Nevertheless, it is massively overbuilt, specially in the PSU section, using current loop amplifiers for optimal PSU performance. How does it measure up against my all-time reference: Lampizator-modified Behringer? Costing at around 200 USD, the Behringer SRC2496 empolyes a so-called Asynchronous Sample-Rate Conversion (ASRC) to reduce the incoming jitter. 1- No jitter reduction activated in Behringer SRC2496. 2- With ASRC activated in Behringer SRC2496. The difference in the percieved sound quality is extremely small. In fact, frighteningly so. It is astonishing to hear that the cheap Behringer can perform 99.5% equally to such a massively designed DAC. A lot of switching back and forth over a long time, with intimately familiar music reveals though that Forsell Air is ever so slightly more resolving in the frequency extremes. That is, the sound seems a bit more extended in the highs and lows, making it a little more dynamic and thus exciting to listen to. The sound-stage size, the placement of the instruments, the fluidity of the rendition, depth, width, height, tonality, texture, are all equal. Behringer is a little more ”forgiving” and offers a very very slightly ”softer” presentation that suits many different styles of music and equipments. whereas Forsell is a tiny bit more detailed that tends to emphasize etch definition if the surrounding compnents are not absolutely top-notch. other than that, it is an EXTREMELY close call. The presentation by Behringer now becomes extremely smooth and effortless, without details getting lost in the process. The difference in the frequency extremes is now in favor of Behringer where low-key notes are rendered with more weight, energy, and iron-fisted tightness, and highes are silky smooth and extended. The sound-stage is now wider, taller and bigger than Forsell's, where the latter feels more congested and compressed. Instruments are rendered with elevated palpability and organic texture, whereas Forsell paints a more rigid and ”mechanical” picture. Allthough it is an absolutely wonderful product, the DA chip used is a first generation Bitstream converter, and a lot has happened in that area. It unfortunately could not keep up with the Lampizator-modified Behringer SRC2496 (with ASRC activated). I know they go for high cash. Just make sure you LISTEN to it before you buy, specially if you buy it over the net. It might be a worthy upgrade or it might not. Remember, they are still very expensive and the competitors are better. Detail, imaging, purity and $$$ value vs. the 20K DACs I've heard. none, for a strandard DAC. Its not as connective as todays DACs but it sounds fab and real. What more can I say!!! If you see one of these rare beauties for sale...don't hesitate, buy it! Did I mention its beatutiful!!! It looks like a 10K piece of gear. This DAC is a trial to see how good vintage DACs stack up against new highly rated DACs. I too compared it to the new Benchmark DAC and it simply blew it away...much more real sounding, bigger soundstage, more liquid, better realistic detail... just simply a far superior product. Soundstage, Clarity and the "live feeling" and let's not forget it's gorgeous! This DAC is simply one of the best ever produced. Comparing to things like the Benchmark DAC 1 it simply blows its performance out of the water despite being several years older. The Air Reference is very "analogue" in it's sound and it's built to match it's vinyl counterpart. From my experience it really makes the music feel alive and brings a huge soundstage to it. While comparing to modern DACs it feels a lot more reliable, both in bass and in the highs.